Dr Boyd Blackwell is an applied economist with the UNE Business School having completed a research program on the interface between remote communities (including Aboriginal and Torres Strait Islanders) and enduring value from mining for the former CRC for Remote Economic Participation. Boyd also has over 20 years of experience in teaching and practicing the economic valuation of environmental and social services (including ecosystem goods and services, life saving services, invasive species). 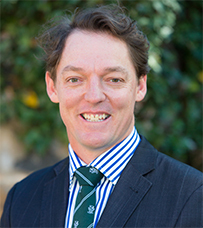 He is currently the President of the Australia New Zealand Society for Ecological Economics (ANZSEE) and along with the support of colleagues, successfully delivered UNE's hosting of the society's biennial conference in 2015: Thriving Through Transformation: Local to Global Sustainability. In 2017 as part of the research outputs from the conference, he co-edited a special issue of abstracts and papers with the International Journal of Rural Law and Policy, the ANZSEE conference proceedings of papers, and presentation recordings — all of which are open access. He likes to work as part of multidisciplinary teams to help solve the world's problems, and enjoys riding his bike to work.